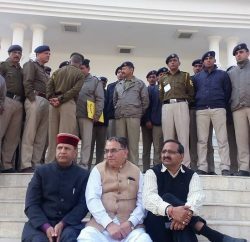 Urban Development Minister Sudhir Sharma and Excise & Taxation Minister Praksh Chowdhary have accused opposition BJP for blemishing the rich traditions of the H.P Vidhan Sabha by boycotting the entire budget session. In their joint press statement, ministers said that in a democratic system, the people elect their representative with a hope that he will raise their issues on priority in the Assembly besides giving pace to the development in his home segment. They said that the Congress Party always believes in maintaining high standards of the Assembly and the development of the State can be given speed and new direction with the mutual efforts of the ruling and opposition parties. But, it is unfortunate that MLA’s of the main opposition party are shirking away from their responsibility and it seems that instead of working as public representative, they are purely functioning on a political agenda where they do not want to talk of public interests and development of the State. The fact is that the BJP is left with no issues and the party is resorting to frivolous gimmicks to mislead the people of the State. The Ministers said that BJP members boycotted the assembly to attend the rally of Narender Modi and attract the media headlines. They said that budget session has prime importance and though many BJP members were in favour of attending it but one faction of the party deprived them of taking part in the house proceedings. The BJP MLAs did not come to attend the house despite repeated requests of the Speaker, Vidhan Sabha, the Chief Minister and the Ministers and this is the saddest part of the history of H.P Vidhan Sabha for which the total responsibility lies on the BJP. This is for the first time in the history of the State that the BJP MLA’s dishonoured the Governor and they even skipped the dinner hosted by the Governor. 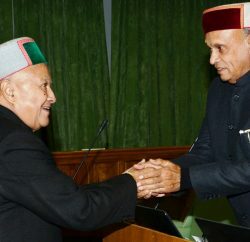 Congress leaders said that the opposition is expected to give constructive support to the government for the welfare of the people and development of the State. But, BJP members not only defied all the decency but also failed to represent their areas for which they should seek apology from the public. It is surprising that BJP MLA’s escaped away from their responsibility to make arrangements for Modi’s rally which shows how well they are serious and concerned for the development of the State and the people who have elected them as their representatives. 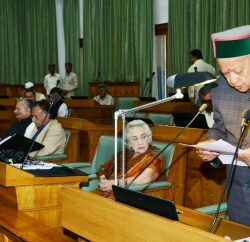 They said that the Chief Minister has presented a pro-development, people centric and growth oriented budget where welfare of the every section of the society has been well ensured. The BJP has nothing to comment on the budget so they kept eluding the house proceedings. The Ministers added that the BJP has become habitual of speaking lies and the party misled the people of the State in the name of development for five years when it was in power. The only noticeable achievement of the BJP government is a long list of cases of corruption and now panic stricken with the ongoing enquiries in to the wrong doings of the BJP government, the BJP leaders have take on unprecedented method to mislead the people and elude from their responsibilities. They said that BJP MLA’s have betrayed the sentiments of the people of the State for which they will have to reply.